We Offer A Wide Variety Of Commercial Roofing Services. Does your commercial structure need a new roof? With significant experience and thorough training requirements, ECO Commercial Roofing is the commercial roofer you can rely on! Our roofers have a wide range of expertise working with different roofing types, so we can efficiently help you with anything from roofing installations to roof coatings! There is a wide variety of commercial roofing systems we carry, such as common EPDM and resilient PVC. When you are searching for a trustworthy commercial roofing company in Texas, Louisiana, and Mississippi, that provides high quality services at an affordable price, contact us at (833) 200-0571 to get started! Commercial roofs aren't like residential roofs, and tend to require a significant amount of extra time and effort for installation. At ECO Commercial Roofing, we are able to handle all types of roofing work, and we have plenty of experience in commercial roofing. Regardless of what your roofing needs are, we are sure to have the services and the prices you need. Throughout the entire process, we work hard to keep you informed, and to make as little of an impact as possible on your day to day business. Whatever your roofing needs are, you can count on us! Flat roofing membranes, as well as metal roofing, and shingle roofs, are all common examples of commercial roof types. All of the roof options available have a selection of different materials to choose from, providing our customers with a great range of tones and textures. With correct maintenance and specialized care, many of these commercial roofing types will be expected to perform over thirty years. Our contractors are professionals in commercial roofing, so if you require a repair, a replacement, or anything else, we will help! 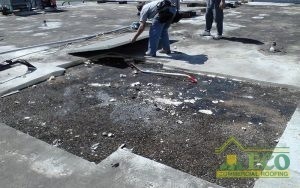 Below, you can find a list of a few of the commercial roof services we provide, as well as links to more information. Contact us today at (833) 200-0571, to set up an appointment with any of our expert roofers. When you require a reliable commercial roofing company in Texas, Louisiana, and Mississippi we are here to serve you! Built Up Roofing Built up roofing is labor intensive and quite heavy, but it provides reliable and very long-lasting protection. Commercial Foam Roofing Foam roofing is affordable, lightweight, and incredibly efficient for insulating and protecting your business. Commercial Roof Installation If your commercial building is in need of a new roof, you can count on our team of roofer for fast installation. Commercial Roof Repair Commercial roofs are susceptible to a wide range of damages, but our team can help with any and all repairs! Commercial Roof Replacement If your commercial roof has come to the end of its lifespan, and you are in need of replacement, give us a call! Cool (Reflective) Roofs Cool roofing options can help you save money on energy costs all year round, due to their reflective qualities. Flat Roof Service Flat roofs are very common in commercial roofing and require specialized services for both repairs and installation. Green Roofing Green roofing options are environmentally friendly and a great addition to any commercial building. Industrial Roofing Industrial roofs are tougher than traditional roofs and ideal for factories and warehouse facilities. Modified Bitumen Roofing Modified bitumen roofing is one of the most commonly used forms of commercial flat roofing on the market. Single Ply Roofing Single ply roofing is durable, affordable, and easy to apply in a short amount of time. Vulcanized Rubber Roofing Vulcanized rubber roofing is sealed prior to installation, making it more reliable and resistant to damages.